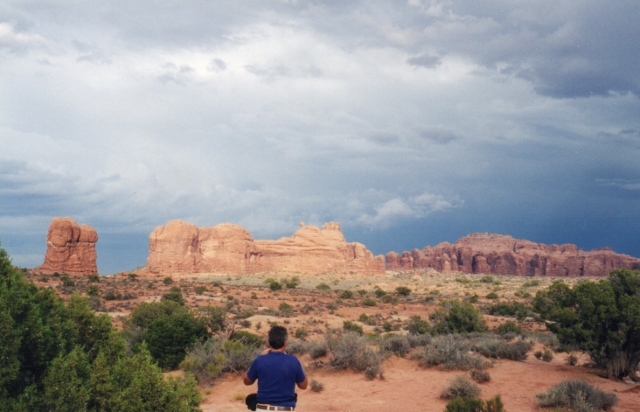 We broke camp and headed northwards, east, and then south to Moab – a long eight hour drive through varied scenery. Farms, rolling prairie, forest beginning to turn into autumn colours, mesas creating fortress after giant fortress on the skyline. A geologist’s heaven. We lunched at a small restaurant with sunflowers poking their heads through the windows. I bought a neckerchief there, depicting cowboys and horses in a sunset; and there were many beautiful trinkets for sale. 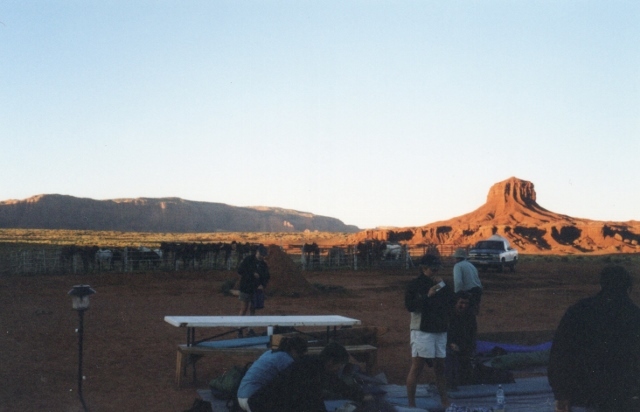 The Moab campsite was crowded. I did not have the energy to explore this one-street town, and the others only ventured out for supper before coming straight back to bed. The life had gone out of us. In Canyonlands we gazed over vast acres of darkly gashed terrain disappearing into the distance, and we wondered at the incredible arches and holes in the rocks contorted into weird shapes and angles in Arches National Park. I even managed to conjure a complete map of Africa within one formation. In the afternoon there was “white water” rafting on the Colorado River, with a stop for a picnic lunch half way. Our river guide entertained us with tall tales and jokes; and at one point he had to skull mightily against a gale. The river was low, so there was minimal white water. However, I managed to justify putting on my swimsuit by being at the wrong end of the raft as he guided it into the roughest bits he could find on at least three occasions. Here, they have opposite ideas to those in Africa. You must not pee on land because it attracts ants, snakes, and other reptiles. However, you may pee straight into the river, which is so vast it processes everything. They say the Colorado is affected by the volume of underground salt in the area, which heaves up the landscape, causing the weird mesas, arches and windows. So maybe the river can’t be polluted; but they could learn a thing or two from Africa about toilet practice in the rough. Their “long drops” are nauseating. I did gently hint to our Navajo guide that perhaps a spade and a pile of sand near the holes in the ground would be less unsavoury, but he looked at me askance, and perhaps it would have been better coming from a man. 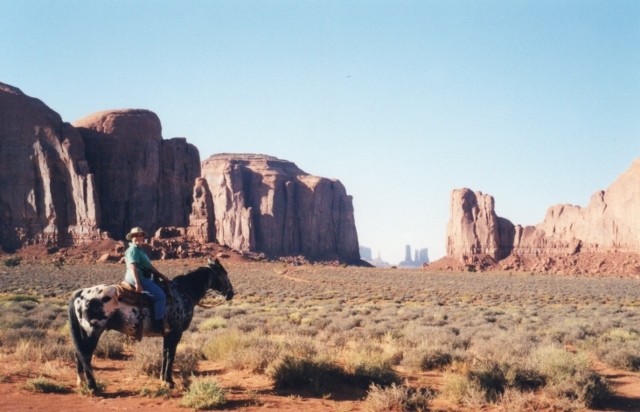 …Which brings me to Monument Valley, home of John Wayne, Roy Rogers and Trigger. We rode our horses past massive rock formations and pillars, familiar from western movies. Our guide issued blood-curdling whoops, which echoed weirdly back to us, and we tried to mimic him. The horses, though rough, were sleek and tough and raring to go. My camera and binoculars hitched round my waist became a nuisance, especially with the high-pommel of the western saddle. So when we met up with my party in the pick-up half-way there, I handed them over, complete with bum-bag. That was better. But I still had to remember not to lean too far forward in the saddle. We rode into camp and corralled the horses in the fast-falling dusk. In a huge natural sandy basin surrounded by mesas and pinnacles, our Navajo guide and his family produced a magnificent Mexican-style meal with special Navajo “bread”: tacos thick and soft. Children costumed with fantastic colourful feathers entertained us with rhythmic dances, insisting that we, too, should shuffle around in circles for several minutes. Finally, we collapsed on logs around a campfire to the strumming of a guitar. I slept soundly that night under the stars. A hasty start to greet the rising sun; a quick breakfast and break of camp. While the others jerked and bumped back to the valley entrance in the pick-up, I remounted my steed and rode out into the morning, ending in an exhilarating gallop, Indian style (on cowboy saddles) up the sandy road back to the viewpoint. 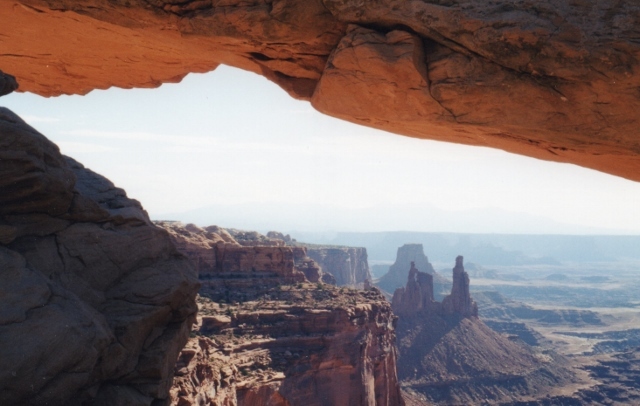 Aside | This entry was posted in Travels and tagged canyonlands, Colorado River, Monument Valley, Roy Rogers, Trigger. Bookmark the permalink.